This is a prototype of Contra III. It appears to be an intermediate localization of the Japanese to US release. Thanks to Bramsworth and contrafan for organizing the fundraiser. So this is what I hope will be the start of many fundraisers this year. This prototype comes from the collection of Niels, a prominent collector who is willing to share the ROMs of his protos for the right price. Kinda the same deal drx had going with DreamTR back in the day. And just like then, as with all collectors, we don't have any screenshots so you'll have to bear with the idea it's an early prototype and leave it at that. I know, I wish things were different. Anyway, this fundraiser is for an early proto from when the game was called Contra IV. 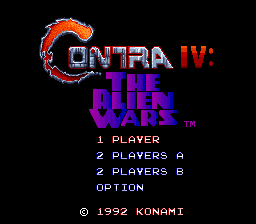 Differences include Contra IV titlescreen, levels with different graphics, different text, incomplete levels and possibly a different ending. I say possibly because Niels doesn't remember perfectly and isn't likely to play through it again to figure out. Our goal is $750, which isn't as bad as it could be. This sounded very promising. 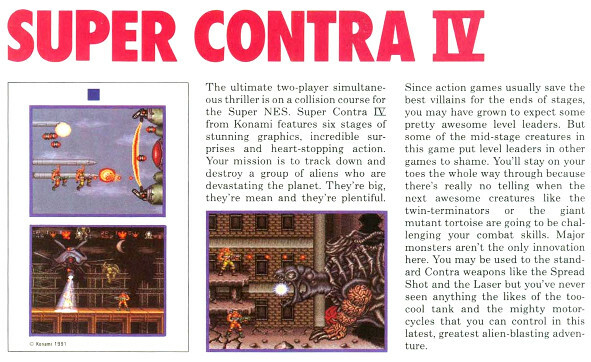 Contra IV and Super Contra IV were early titles for Contra III, reported in several game magazines (see below). 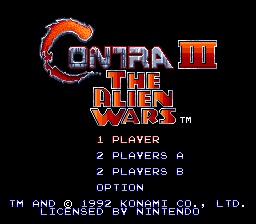 The decision to change the title to Contra III instead came very close to release, possibly by only two or three months. It appears that the name change happened around Winter CES 1992. I speculate that Contra Force on the NES was supposed to be Contra III, but it was released after the Super Nintendo game. Contra 4 ended up being the title of the 2007 Nintendo DS sequel. According to Wikipedia, Contra Spirits (the Japanese version) was released in late February, 1992, while the North American release came in April 1992. 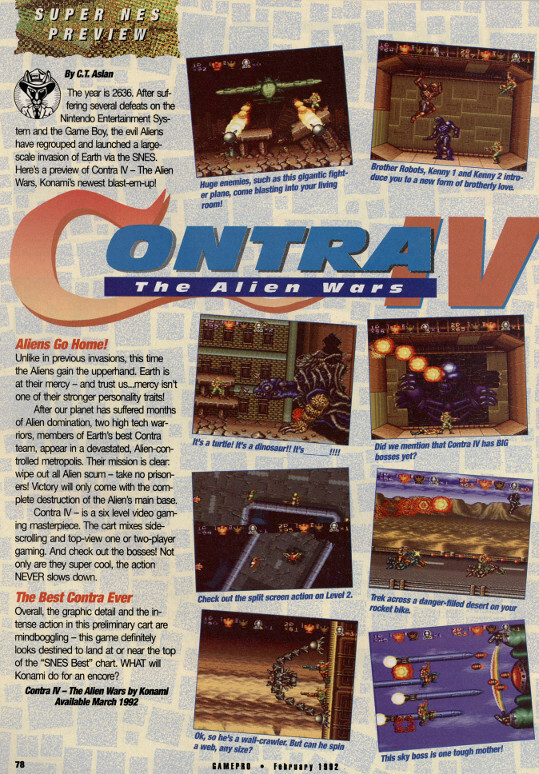 Mention of "Contra IV" in a preview of Contra Force for the NES in the January 1992 issue of Nintendo Power. Scan courtesy of Retromags. 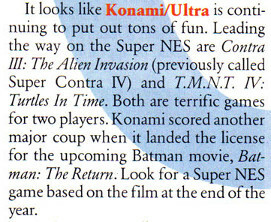 Preview of "Super Contra IV" in the Super NES Player's Guide, published in early 1992. Scan courtesy of Retromags. 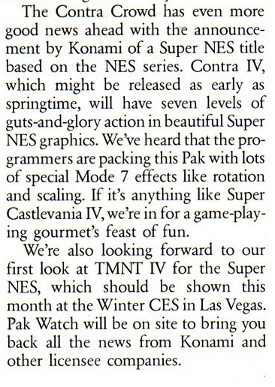 Mention of the title change in the March 1992 issue of Nintendo Power, CES coverage. Scan courtesy of Retromags. Preview in the February 1992 issue of Gamepro. Scan courtesy of Retromags. The title logo is clearly a placeholder. The prototype itself has no appreciable differences from the final release, and has features that show this is merely an intermediate localization of the Japanese game. The introduction text is the same as the US version (The Alien Wars Begin! It's time for revenge. Let's attack aggressively.). The prototype has the same options as the Japanese version, including cheat codes and infinite continues. By directly comparing the binaries, the prototype is about 5% different from the Japanese binary, and about 4% different from the US version (the Japanese and US versions are actually more slightly similar than this). Since the graphics are compressed, it is hard to say whether there are actually any other differences, though a side-by-side playthrough of the first level did not reveal anything noticeable. The released binary is 4 MB, which is three times larger than the typical ROM size of Contra III. I checked it out, and the third quarter of the ROM image is identical to the first quarter (i.e. it is the game binary). The second and fourth quarters are essentially blank. You can actually cut out the last three quarters of the binary, and it will work fine. The game won't work in some emulators (and possibly flash carts), as the internal header is set wrong. I have included a fixed ROM image at the end of the article. I speculate that this prototype was originally given to a US magazine for preview, such at the Gamepro preview above. Given the time of the title change (Winter CES, January 1992), it probably does predate even the Japanese release of the game. Given the amount that was paid for this prototype, this should be a lesson learned for group fundraisers. I have purchased some great prototypes from Niels (aka Simon_Belmont) in the past (these were released on SNES Central last year), so I thought that this would be a safe bet. With that said, there was the promise of something that was substantially different from the final version, and this was not a small amount of money. This was a rip off. Future fundraisers must include a gameplay video or screenshots to illustrate the significance of the prototype, or else I see little point in supporting them.